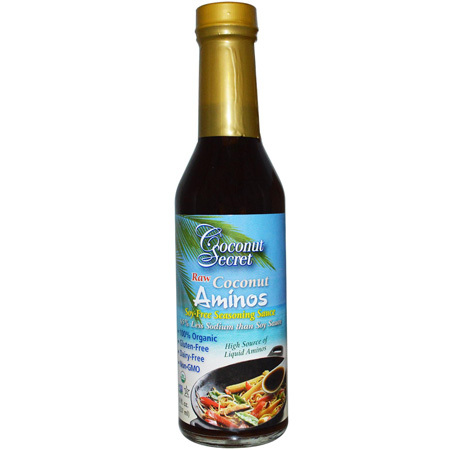 Have you heard about coconut aminos? Essentially it’s the sap from a coconut that’s filled with amino acids, which rebuild muscle tissue, boost the immune system and raise physical energy levels – along with much, much more! I just learned about this magical condiment and used it in one of my recipes in place of soy sauce. Chad is doing the Whole 30 diet, which is a 30 day intensive paleo diet. It doesn’t allow for soy sauce, so when my recipe called for it I was stumped until a friend recommended coconut aminos – genius! My dish tasted delicious and wasn’t missing a thing. It’s time to knock your socks off with this dinner recipe. We made them into lettuce wraps – YUM! Wash and prepare chicken, cutting off all the extra fat. Cut chicken into cubes and set aside. In a large skillet heat the coconut oil or ghee on medium heat. Add the ginger and scallions stirring frequently to prevent burning. Let cook for 2 minutes and then add the coconut aminos, date syrup, coconut milk and sesame oil. Stir together on medium heat and add chicken cubes. Stir frequently until the chicken is cooked through. Lastly, add the chopped cashews for a topping and serve. You can use tofu instead of chicken if you’re going for a veggie option. Making these into lettuce wraps was a delicious, different idea.